When you visit the Office 365 portal you are normally greeted by your inbox via Outlook Web Access as you can see above. What you might not appreciate is that you can now customise that. 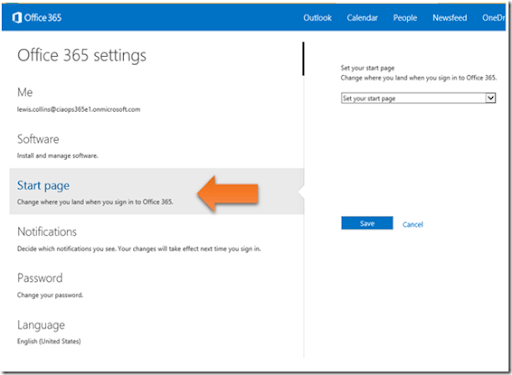 To change the page which you first see when you login to Office 365 login to the portal. Select the COG in the top right (near your picture). 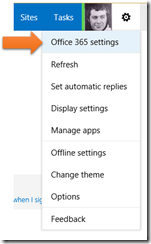 From the menu that appears select Office 365 settings. From the menu that appears on the left select Start page. If you then pull down the option on the right (Set you start page) you will see that you can select from range of options shown above. Make you selection and press the Save button to complete. Next time you login to the portal you will be taken to the page you selected (here Sites). Each user can customise their own Start page at any point using this method. 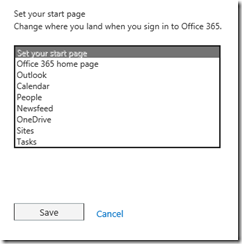 Previous Post Are you coming to Office365 Nation?